A sectarian attack on a schoolboy in the Country Antrim village of Stoneyford has been linked to ongoing intimidation of a Catholic family in the area. The 12-year-old was walking with his 13-year-old friend, who is a member of a family that has been specifically targeted by loyalists in recent months. Earlier this month the family were warned of a loyalist death threat against them by the PSNI. The boy and his friend were walking along Dam Lane in Stoneyford village at around 6.20 on Thursday night when they were approached by three men in a car. The 13-year-old, who was aware of a loyalist death threat against members of his family, ran away. But his 12-year-old friend was assaulted and threatened by the gang. The family believe their son was the intended target of the gang. When the gang grabbed the 12-year-old they questioned him about the whereabouts of the other boy. “They were shouting at him and asking where my son had gone. This was obviously linked to the death threat against my family,” said the 13-year-old’s father. The father said the sectarian campaign against his family was very stressful. “We are living under a shadow and we don’t know what is coming next. This has affected every aspect of our family life,” he said. Earlier this month the PSNI warned the family that loyalists were planning to “kill a male living in this house”, said the father. “There are four of us, myself and my three sons, the youngest of whom is only four years of age,” he said. The PSNI have admitted to the family that they are aware of who is masterminding the campaign of intimidation but despite this the PSNI have taken no action. Two years ago a member of a gang of a well-known loyalist organisation was charged with threatening one of the sons. The family did not take the case to court in the hopes that his gesture might ease tensions. Despite this the family were forced to move out of their home and relocate in another part of the village. A dossier detailing the intimidation of the family and other Catholics living in the Stoneyford area was presented to the PSNI by local Sinn Féin MLA Paul Butler last month. Paul Butler met with the Assistant Chief Constable Duncan McCausland and District Commander Paula Hilman in the Castlereagh PSNI station on Friday, 16 November about sectarian attacks in Stoneyford. “I asked for this meeting because there is an ongoing campaign of intimidation against Catholics by a group of loyalists in the Stoneyford village”, he said. ‘The PSNI gave me an assurance that the well known loyalist behind the campaign is not being protected by them. But within hours of Sinn Féin calling for the PSNI to protect Catholics living in the area, the gang attacked the home of another relative of the family. On Halloween night the house of the children’s grandmother was targeted and a barrage of fireworks were launched at the house. Commenting Sinn Féin MLA Paul Butler has said the incident was only the latest in a long campaign of sectarian intimidation in the Stoneyford area. 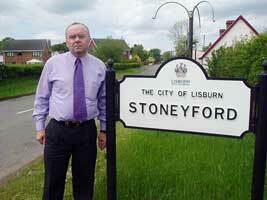 “The PSNI have failed the catholic community of Stoneyford,” said Butler. “I am very concerned that these attacks have come after my meeting with the PSNI about sectarian attacks in Stoneyford,” said Butler. The Lagan valley MLA said he is to ask the Police Ombudsman to investigate sectarian attacks on Catholics in Stoneyford and the PSNI’s failure to arrest or charge anyone. He also called on unionist politicians to show leadership. “Unionists must do more to bring a halt to these attacks on the Catholic community. Unfortunately there is a deafening silence from both the DUP and UUP about this ongoing campaign in Stoneyford,” said Butler. DUP MLA Jonathan Craig condemned the latest attack. “Lisburn Borough Council, the PSNI and the local community have been working to improve community relations in the Stoneyford area,” said Craig.